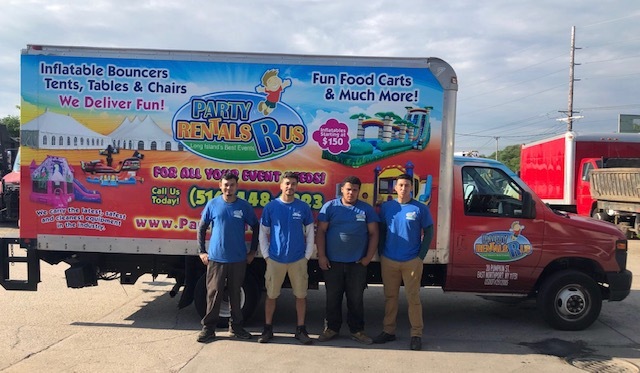 Party Rentals R Us provides party equipment delivery service throughout the great Long Island, New York area and it's surrounding communities like Roosevelt, Levittown, Baldwin, Glen Cove, West Hempstead, Great Neck, Manhasset, Massapequa, and Merrick. This is just a partial list as we serve all the surrounding Long Island area communities. If you have questions regarding delivery to your specific location, please call us at (516) 448-0323 and we will be happy to assist you with details and delivery fees should that apply. Here at Party Rentals R Us, we focus on providing excellent customer service, and one of the things we work very hard on is on-time delivery, we not only going to show up at your event, but we are going to show up on time or earlier than expected. On our busiest time on the season we might even deliver the day before for event if your renting an inflatable bounce house combo and up to two days before your event if you renting a tent package. We offer free delivery and set up within 10 radius miles of our office located in East Northport, NY. If you click on your area, it will tell you how much the delivery charge would be for your town. When you do call, please be sure to let us know about any conditions on site like narrow pathways, stairs, gates, fences and any other conditions that may be obstacles to our delivery crews and trucks. Our goal is to provide you with the best possible customer service, so the more we know up better we can serve you. Also, not all cities we serve are listed, call us with any questions (516)448-0323.